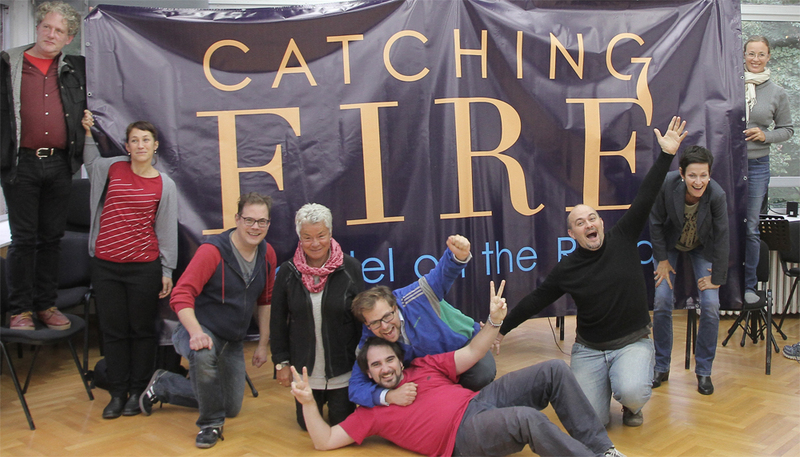 Merle Fahrholz and Alvaro Schoeck have worked out the concept of Catching fire – Haendel on the Road. They are also jointly responsible for the artistic direction and the general management of the project series. Marijana Mijanovic is responsible for the musical coaching of the singers. The contralto Marijana Mijanovic was born in Serbia. As a baroque specialist, she has performed at opera houses such as the Palais Garnier (Paris), the Theater an der Wien (Vienna), the Théâtre de la Monnaie (Brussels) and the Zurich Opera House, as well as Festivals such as the Festival d’Aix-en-Provence, the Glyndebourne Opera Festival and the Salzburg Festival. She has worked with the conductors William Christie, Alan Curtis, Paul McCreesh and Marc Minkowski. The workshop leaders for the project in Belgrade 2015 will be Francesco Damiani (Music Director of the Young Opera department of the Nationaltheater Mannheim, Germany), Anabel Heiden (Theatre education, Germany), Veronica Peyer (Theatre education, Switzerland), Robin Philips (Stellvertretender Studienleiter Nationaltheater Mannheim, Germany) and Georg Schütky (Director, Austria), as well as Predrag Gosta (New Belgrade Opera and Belgrade Baroque Academy) for the musical coaching. Francesco Damiani studied piano, composition and conducting in Italy and Germany. He conducted several orchestras in Italy, Germany, the USA and South Korea. Since 2014 he is engaged as assistant of the choir director and musical director of the Young Opera department at the Nationaltheater Mannheim. Furthermore he is a founding member of the ensemble “Musicarchetipi” and engages himself for the staging of new music and world premieres. Anabel Heiden is a grammar school teacher for German and Spanish language and literature with a broad experience in theatre work. After acting in a semi-profesional theatre group and an internship at the Young Theatre departement of the National Theatre of Mannheim (Germany) she is now leading her school’s drama group and works whith children between 13 and 19 years. Due to a cooperation of the school’s drama working group and the National Theatre of Mannheim, Anabel was introduced to Merle Farholz and Johannes Gaudet whith whom she worked in a theatre performance project whith young people. Robin Phillips studied piano in South Africa and London. Since the year 2000 he works as a répétiteur at theatres such as the Südthüringisches Staatstheater Meiningen and the Badisches Staatstheater Karlsruhe. He was also engaged at the University of Arts Zurich, where he was the musical leader of several productions with students. Since 2012 he is engaged as répétiteur and Stellvertretender Studienleiter at the Nationaltheater Mannheim. Primarily educated as a teacher, Veronica Peyer added studies in theatre education at the Universities of Art in Bern and Berlin. She mainly worked as high school teacher, but also as assistant director at the Theater Biel Solothurn, where she staged the children opera “D’Horchhäxe”. She was responsible for the work with the students in educational projects at the Theater Biel Solothurn, such as “Varietà – L’altro Trovatore” and “Wunder: Herkunft unsicher. Wege zu La Cecchina”. Georg Schütky was a member of the Vienna Boys Choir before studying opera direction at the University of Music Hanns Eisler (Berlin). In 2012 he has staged the cantata Ich hatte viel Bekümmernis (Johann Sebastian Bach) at the Opera Leipzig, in 2013 he jointly created with Johannes Schütz a widely renowned performance of Ariodante (Georg Frederic Haendel) at the Salzburg State Theatre. In the summer of 2014 he staged the opera Der Freischütz (Carl Maria von Weber) as an open-air production at the Burg Gars in Austria. Johannes Gaudet and Georg Schütky are the workshop leaders in stage I. Johannes Gaudet is responsible for the musical education, whilst Georg Schütky works on the scenic realization. JOHANNES GAUDET works in the Young Opera department of the National Theatre of Mannheim (Germany). He is responsible for young audience development and music education. He is regularly giving workshops to children and young people but also working together with composers and opera directors on the creation of modern music theatre for young audiences. He is a professional percussionist and has also worked as musician and music director for the Theatre Freiburg (Germany). The Red Cross Sombor is the host of the International Summercamp Sombor. The INTERNATIONAL SUMMERCAMP SOMBOR is a place where different cultures meet and mutual understanding is developed. 80 young people from the countries of former Yugoslavia and the rest of Europe meet during ten days in the summer. The program gives them many possibilities to explore different forms of communication. The participants are invited, to express themselves, to exchange opinions, be creative, have fun, develop ideas and visions, make friendships and do sports.